April is poetry month – the task is to write a poem a day. Thirty pieces out there on screen or on paper. I don’t write poems but flash fiction is a close cousin to prose poetry – some would say even its identical twin. Anyone want to join me and write a Flash Fiction/Prose Poem a day? Flash fiction writer and director of National Flash Fiction Day, Calum Kerr, wrote one a day for a year. Thirty days is a a snip in comparison. 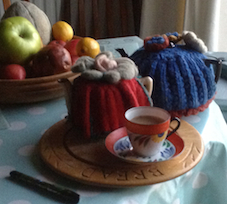 If you do want to complete thirty days of flash, tweet me on @judehwriter Perhaps we can arrange a regular cup-of-tea tweet-time each day and compare notes? I also like the following exercise suggested by Steve Almond in the same book – a brilliant idea for revitalising a tired short story or one needing to loose its flab. He suggests that you ” stop whatever story you’re working on and convert the whole thing into a poem. It will end up as a much shorter piece, in which you bid various extra words, characters and subplots, goodbye.” The poem can be as bad as you like.When you’ve finished you remove the line breaks and examine the resulting piece of prose. Leaner, tighter and now, perhaps, fizzing with energy. I’ve a few sad little pieces that could do with this treatment. Inspiration also comes from checking out current flash fiction competitions. It would be good to have 30 pieces to pick from when considering which to enter. It’s a shame I can’t enter Bath Flash Fiction Award – no-go – I’m organising it. ( I would if I could though – even though I say it myself – with 3 different entry options it tries its best to get as many writers on board as possible. And there are big prizes and a great short list judge , Annemarie Neary). The Bridport Flash Fiction competition has its usual pull – something good may turn up for that and there are also the super fun competitions at themolotovcocktail.com to inspire. A new competition, Flash Fury, is kicking off tomorrow, April 1st and the results of their latest competition, Flash Fool, will be announced on the same day. The guidelines for general submission to the ezine on their site, as I said in a recent tweet on @bathflashaward, must be the most pertinent and funniest around. For anyone wanting to write a fresh-sounding story of any length, it’s great advice whether or not you like submitting to magazines. A recommended read. All that remains is to write – today, 31st March = warm-up day. I’ll go for a handwritten story in my under-used new journal. I had fun adapting the title for this post from the witches’ spell in Macbeth “Double, double toil and trouble; fire burn and cauldron bubble… for a recent tweet at @bathflashaward. I can’t resist using it again. A Dribble is the term for a 50 word story, a Drabble, 100 words and a Trabble, 300 words. I don’t believe the writers who came up with these terms toiled to find them. I’m sure they were playing in order to discover a fun way of encapsulating the essence of the form – very short but not only that – something more. Perhaps that is why I took the phrase from the witches’ chant in Macbeth. Good tiny fictions mesmerise. Like a spell, you can be changed by a mere few sentences. Minute Story, Pocket-sized story, Palm-Size story, smoke-long story, hint fiction. quick fiction, fast fiction, furious fiction, sudden fiction, flash, five-minute fiction. Very short fiction can be ephemeral, written fast and then forgotten. But gone in a moment, they can also linger long like the brilliant flash of that iridescent insect you might first have seen as a child and never forgotten. There’s an ongoing debate as to whether prose poetry is the same as very short stories. ‘Flash’ fiction – arguably the term most widely used – in the US and UK at least – was coined in the early 1990s by the writer James Thomas who, together with Robert Shapard collected stories published in an anthology called Flash Fiction in 1992. I don’t know why there is so much fascination in providing different names for stories 1000 words and under. There are many more names than the ones I’ve mentioned. Longer stories only get the one name – short stories. Longer still you get ‘novella’, then, of course, novel. Perhaps it’s because the shorter the story becomes, the more room there is for experimentation. Nearly everything can fall away – plot, structure as well as most of the words. The one or two word description for the genre, can be itself a tiny story. Yesterday, I was lured into a stationery shop by a display of notebooks and pens in the window. 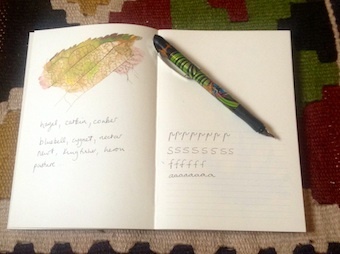 It’s a minor addiction – a new notebook makes me happy. 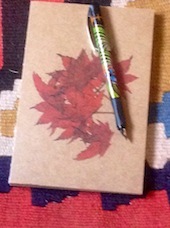 Even though I vowed not to buy more, I couldn’t resist this one with its satiny paper and pictures of leaves. Oh…and I bought a ‘starter’ fountain pen to go with it. Wandering alone down the lanes of my girlhood and on through pastures or by the river in the 1950s and 60s, I frequently saw, heard, smelled, tasted or touched all of the plants, birds and animals named in this deleted list. At the age of eight or nine they were part of my everyday world. And I loved the names – catkin, acorn, adder, ash – repeated them like spells. When I first joined a creative writing group, the tutor, novelist and poet Lyndsay Clarke, advocated using Anglo Saxon words as much as possible Several of the deleted words, like ivy and cowslip and adder are Old English in origin. I learned these words when I saw the living things in their natural landscape, so for me their meanings are multi-layered. The dictionary ‘replacements’ are hard-edged and airless. They don’t belong in any specific environment. So, what about hand-writing ? I have always enjoyed using a pen on paper and making letter shapes that are uniquely me. At school we had ‘penmanship’ lessons – joined up rows of ‘p’s or ‘s’s in long patterns. It wasn’t a waste of time. I can’t think how it would be even now. Learning cursive script established me in a particular way. It’s obvious that a person’s identity is embedded in their handwriting. As a young child, I observed that my best friend’s writing had an entirely different character from mine. Seeing the way she formed shapes when we sat together learning how to write, helped me recognise her individuality. My neighbour just received a letter from her twenty-five year old son and she told me that reading his handwriting was an entirely different from reading an email. Immediately, she wanted to write a letter back. Most people who receive personal letters like to keep at least some of them. You can’t unfold an email in years to come, smell the paper, study the writing and remember the person in the same way. I treasure a letter from my mother written before she had a stroke. Afterwards, with reduced motor skills, her handwriting became pinched and cramped, her identity shrunk, along with the space in her hand writing. Buying the notebook and the pad was a small act of defiance. I’ll write draft stories in it with my loopy, untidy script, naming adders, acorns, beeches and bluebells, kingfishers and newts. No bullet points, no celebrities.